Hangin' around with Farley Mowat in Cape Breton. Over the years, Silver Donald Cameron has often been asked to speak to groups of writers or potential writers, and he has held three appointments as writer-in-residence at universities. He has also written for writers' newsletters and magazines. Here are some of his most-requested hand-outs and examples. In 2000, the Canadian Conference of the Arts called for proposals to write a booklet on the ArtsSmarts program. Committee members later told Silver Donald that his proposal blew all the others out of the water. The ArtsSmarts assignment led to three further projects which became known as The Little Square Books, and the research for the booklets generated other magazine articles, newspaper columns and the like. Silver Donald considers that this one proposal eventually brought in work worth well over $100,000. 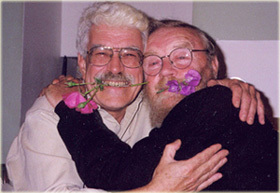 Silver Donald Cameron has published entire books of interviews, and has done countless hours of interviewing during the course of his research for books, magazine articles, radio documentaries and other work. When the Writers Federation of Nova Scotia asked him for some words of wisdom about interviewing, he contributed this piece to their newsletter. 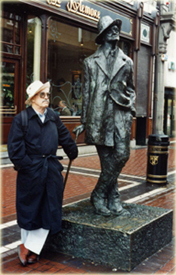 Hangin' around with James Joyce in Dublin. How do you decide what fees to charge for a writing assignment? The late Howard L. Shenson billed himself as "the consultant to consultants," and wrote many books and articles of advice to self-employed knowledge workers. Silver Donald Cameron read Shenson carefully, and adapted Shenson's formula for his own use. This brief manual on the art of writing was created to help the Canadian Parks Service achieve competence and consistency in its written materials -- but much of Silver Donald's advice in these guidelines applies equally to any form of writing, and could be useful to any organization. Writing as a Business consists of the outline notes which Silver Donald has used when he's been asked to speak to writers' groups about making a living as a writer. "Writing is about making magic," he says -- but having the time to write is about making money. A writer who depends on writing for his or her income must approach writing as a business, and pay attention to time management marketing, negotiating, book-keeping and much else. The seminar is designed to help writers do that. In the matter of subsidiary rights, here's a story everyone should know about.